The whiteboard markers under consideration of the article review. Maybe hundreds of thousands of people are using whiteboards everyday to communicate, create and innovate. It has been too long that whiteboard markers stayed overlooked and the time has come to shed some light on these humble pawns of strategic office play. This is probably the most comprehensive review of one of the most underestimated tools of the modern technology world. While these markers are very important for the modern office life there is still a certain vacuum of information around the topic. With this article I will try to break through the void of knowledge and share my review of the most popular markers found all over the world. This is not a commercial ad and I was not sponsored by any of the mentioned brands. While assessing the markers under consideration I am only sharing my own experience and opinion and all the conclusions drawn should be treated as such. Even though I am sharing my own perspective on the assessed samples, I have taken all the measures possible to stay unbiased and objective in my judging. Further, this summary overviews nine brands only, there are many more brands available on various markets. Each marker certainly carries its own character, all of them are unique. Since this article is truly a very long read and you need to be somewhat nerdy about markers (just like me) to read it in its entirety. Or maybe you want to learn all of the nitty-gritty details. But if you are out of time and you need to have a quick answer to the question: “Okay, out of those 9 assessed markers, what would be the best choice for me?” then you can read this section only and maybe later look into the below high-level overview each of the markers. You might arbitrary review other sections when you have more time and in any order you prefer, it does not really matter as long as you enjoy the read. I was hesitating to suggest the ranking based on my own opinion, but decided to present each of the marker under consideration as an unnumbered list with pros and cons for each. I will let each reader decide what is the best marker. Pros: great colour, outstanding tip quality, nice ergonomics, cheap, available in most European countries, limited reliability. Cons: might be somewhat smelly for some people, black and red colours fade over time. Pros: great tip quality, great colour and ink flow, refillable, widely available. Cons: the ergonomics is certainly not the best, might be too smelly for some people. Pros: cheap, great colour, great ink flow, nice felt tips. Cons: limited to US, has some ergonomics issues, might be too smelly for some people, not refillable. Pros: cheap, great colour and ink flow, nice felt tips, limited availability in Europe. Cons: has some ergonomics issues, might be too smelly for some people, not refillable, might be tricky to remove if you keep it on the board long enough, colour may be unstable. Pros: fancy pump-up action, great colours and ink flow, relatively easily available. Cons: smelly, pricey, not refillable, has some ergonomics issues. Pros: is the least smelly, fantastic ergonomics, great ink flow, refillable, there is grey colour available. Cons: re-fills might not be available for purchase in some countries, not easily available, colour is sometimes unstable, tip is too soft, very expensive compared to other markers. Pros: is almost not smelly, good ergonomics, great ink coverage and flow. Cons: not refillable, the most expensive among other markers, not widely available. Pros: fantastic plastic boxes for sets, available in most European countries, nice ergonomics, limited reliability. Cons: quality of the tip, pale colours (black is not impressive) that may fade over time, one of the smelliest if you are concerned. Pros: relatively cheap, great colours. Cons: one of the smelliest, poor quality of the tip, very limited colour range, not easily available, not refillable, has some ergonomics issues, colour is sometimes unstable (especially the black one). The parameters were assessed on the set of markers of 9 different brands that are the most common to find around the globe. The design of the marker is very simplistic, more or less convenient to hold in a hand. The cap is firm to cap the marker (however you need to apply some strength), there is a small nest on the back of the marker to fix the cap when the marker is uncapped, which is good — the cap will not accidentally fall off when in use. Important to notice that manufacturer explicitly recommends to store the markers in horizontal position when in use (notice that it is recommended so for any other brand of a whiteboard marker). Somehow I always thought that markers are best to be stored vertically, with their felt tips pointing down. Well, that was obviously a fallacy. So store horizontally from now on (if not yet). The manufacturer suggests a wide range of other types of whiteboard markers that vary in ink colour (e.g. there are neon colour markers), tip type and size (chisel, point, fine and super fine) and other fancy and crazy things. You can check Expo site if you want to learn more. 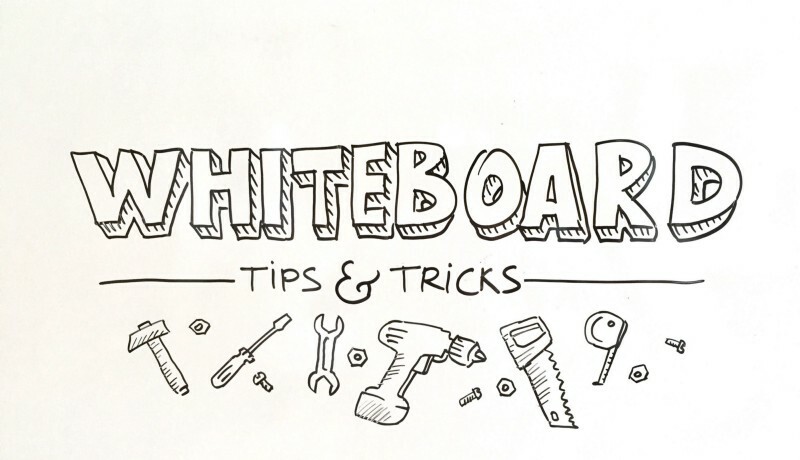 By the way, they have a nice FAQ page where, you might want to check it out, it has some practical tips on using whiteboard markers, not necessarily the Expo ones (those tips are applicable to any whiteboard markers in fact). Expo markers that took part in the overview. The design of a marker is somewhat unique, the marker is a bit too thick to my taste. What I find good about the design is that the cap has a little knob that I assume is intended to prevent the marker from rolling off a table for example. Also, the ink cartridge is attached to the rear part of the marker, the cartridge is made of transparent plastic so you could easily see how much ink is still there — it is easier to predict when a marker is going to run out. I like the markings on the top of a marker cap — easy to identify the type of a tip (in case you are owning various types). And the cap may be placed on the back of the marker when it is in use, however, the cap is very easy to fall off when you are drawing something. The description on the body suggests that there are spare tips, meaning they are replaceable. The marker is available in at least three variations of the tip — bullet, chisel and extra fine. You may find more information on their official site. Pilot chisel tip markers that were reviewed and some other marker types that were at hand at the time of writing this article. This is a nice looking and relatively easy to hold marker, slightly just a bit too thick in my opinion. The unique feature of these markers is that they come with so called pump-up action — there is a button on the rear of the marker that you could push when the marker show signs of running out of ink. Also its body is made of a transparent plastic so you can see how much ink is remaining — a convenient feature. Caps come with an indication of the tip type, again, useful when you possess and actively use various types. Cap can be attached to the rear end of a marker when in use, holds more or less firmly. The manufacturer suggests that you can leave the marker uncapped even for a long period of time. And they insist that the marker has 3 times longer distance (approx. 1100 m of an uninterrupted line) than standard marker. But it is not clear what markers they compare to. These markers can be found with various types of a tip — bullet tip, chisel tip, fine bullet tip and fine chisel tip. More information can be found here. Pentel bullet point markers that were reviewed. It was a pure accident that I have chosen Edding 28 markers for the review — I could not acquire Edding 360 which are the most common to find in stationery shops. These two markers are almost identical, while Edding 28 is claimed to be made from recycled materials and has a removable end that makes it possible to refill it with fresh ink much faster than it is suggested by the manufacturer for Edding 360 model. I assume that the ink used for these two types is the same. You can attach a cap to the rear end of the marker while in use. Edding 360 is easy to lose the cap in that position, Edding 28 has even a shorter stub so the cap falls off even easier. Edding whiteboard markers come in a variety of tip types and sizes, colours and form factors. There is a comprehensive catalog of products available here, start from the page 28. 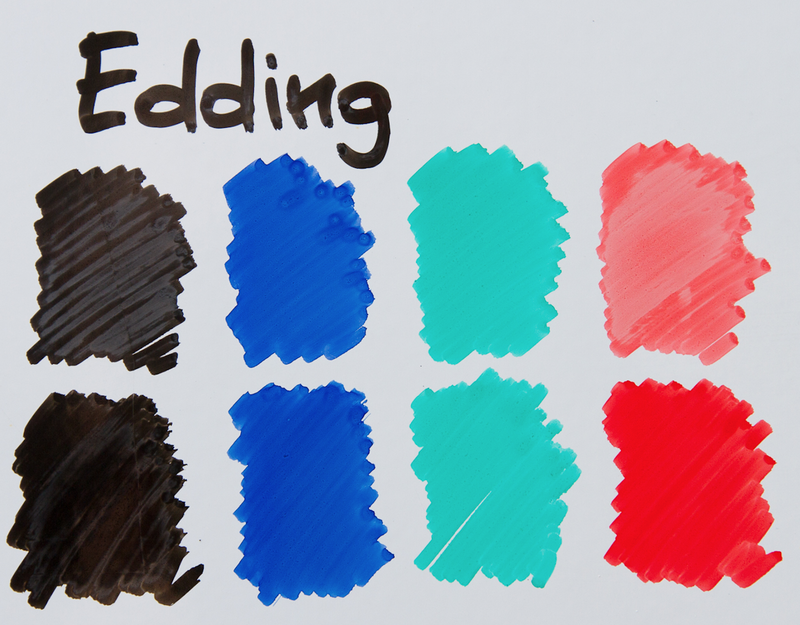 Edding 28 markers (under review) compared to the more common Edding 360. Sharpie markers appear to be the exact copy of Expo markers owning to the fact that these two brands belong to the same corporation. The reason I have chosen Sharpie for this review is that Sharpie markers are available for sale in Europe, while Expo are exclusive for North America, unless you decide to order them online from US (like I did). 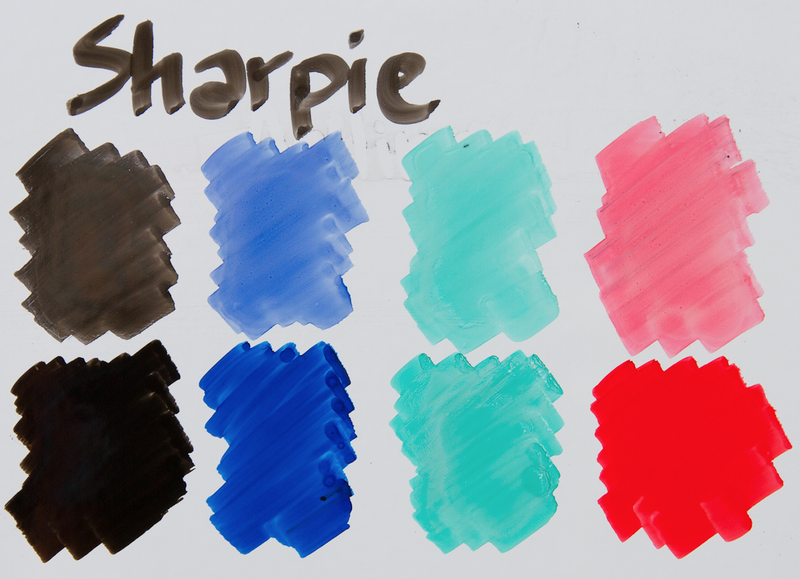 Sharpie whiteboard markers do not come in the same variety of tips and colours as Expo do, however. Check that out here. Sharpie chisel and bullet point markers, compared to Expo marker. This marker is a very standard cigar type marker. Caps are marked to simplify identification. Markers come in different tip type and sizes. For all the available variations visit their site. Cap is firmly attached to the rear end of the marker preventing it from accidentally falling off while in use. The manufacturer claims the markers to be refillable. Since the marker body is securely sealed, the markers are refilled via capillary action. Full refill is promised in 4 hours with a marker attached to the refill station. Check here to get a general idea. I find it a German feature to suggest this type of refill technique as you do not find this method with any other manufacturers. Their kit boxes are worth a separate mention — I find them very handy. The boxes make it easy to transport and store markers. Staedtler whiteboard marker sets come in handy plastic boxes. This is the marker from the famous manufacturer of markers for graphic facilitation. I am personally a big fan of the other Neuland products and naturally I got myself a set of their whiteboard ones. And apparently I wanted to see how these match against more mundane whiteboard markers. Neuland markers are available in three types of nibs — bullet, chisel and fine bullet point. These markers have been designed to be refilled with an injection of refill ink into an opening in the rear end of the marker using a special hand pump. Nibs are replaceable. See more details on their site. 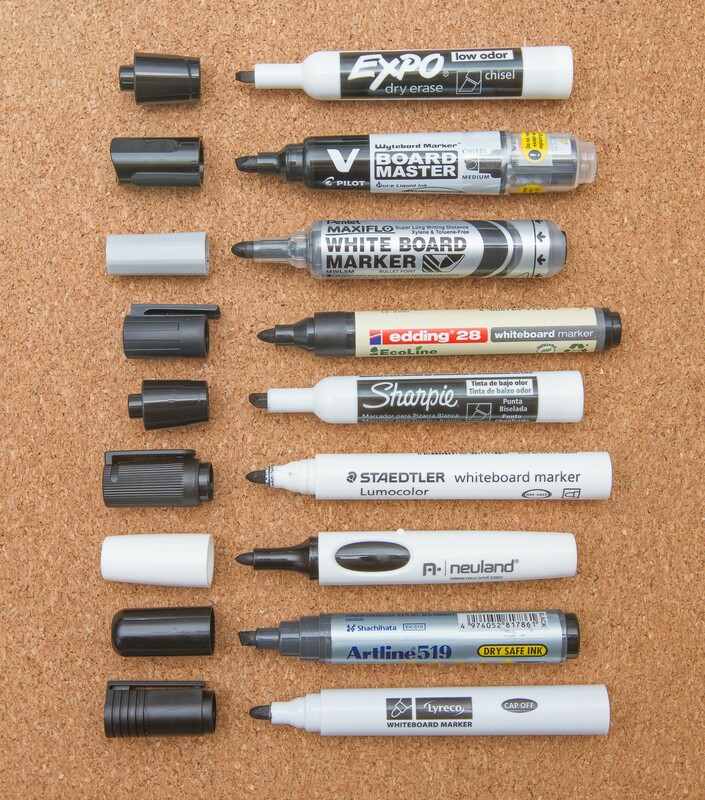 Markers have a small knob on their bodies to prevent them from rolling off tables. There are two cavities on the sides of the body — those, I assume, are intended for a better and handier grip. Cap is firmly fixed on the rear end of the marker so it is secured there while marker is in use. And I think it is important to state it explicitly — this is the only brand of whiteboard markers that suggests grey colour. It is very important at least to me personally. There is no need to order the entire set however — you can order single colours separately. Neuland No.One whiteboard marker, round nib, full set of colours. These markers appear to be very popular in Asian region and I bought a couple of them last summer when I was on a business trip to Kuala Lumpur. I purchased only black colour but still decided to give it a go in this test. Artline suggests a very elaborate product range for whiteboard markers. Here you can find a full catalog of available items — there are various colours (including also neon), tip types and sizes. This is the marker that is very common to find in Danish offices. Since I live and work in Copenhagen, I had access to these samples and decided to assess them in this review. While working on this review I have accidentally run across Staples Remarx whiteboard marker that appears to be the exact copy of the Lyreco whiteboard marker (and are found in Swedish offices of my employing company). I assume these two companies just brand a “white label” whiteboard marker available from some third party. This is a very regular, no fancy whiteboard marker. I thought it would be good to assess such a regular marker so you could get an overall idea what to expect from other lower-end markers available on the market. The cap can be attached to the rear end of the marker, but does not hold in place and fall off immediately. These markers are not available in many colours — only the basic four. But they also come with chisel tips. Here is the official product page where you could also find the specification with health safety information. So if you cannot find a marker brand that you like or if you have an elaborate overview of a marker that is not covered by this article— you are more than welcome to share your experience in a comment below. The review has been performed on top of the parameters that had been kindly suggested by the best graphical facilitation practitioners as discussed in this thread. I thank all of you who contributed on that thread — thank you guys! 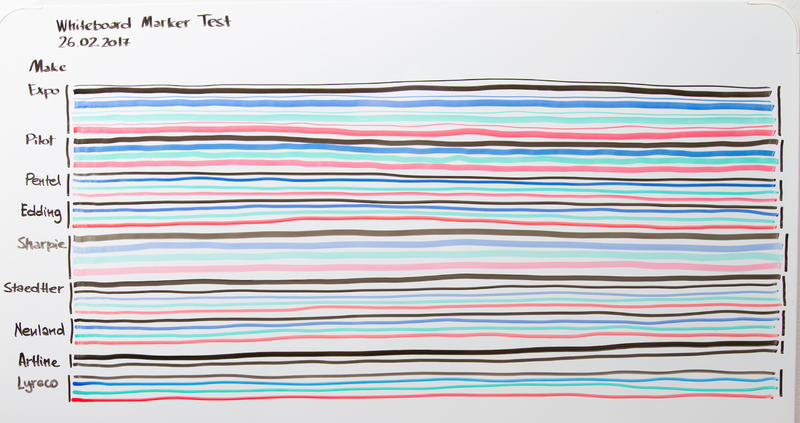 The colour range of the tested markers. Unfortunately, I was not able to acquire the entire colour range of the tested samples. Therefore we have so many empty circles on the photo above. (Additionally, after the chart had been created, I have learned that some of the brands have wider colour coverage.) Still, the most usable colours are black, blue, greed and red, so this should not constitute a big problem for our test. So we should mostly focus on comparing the basic colours. It is only a shame I could not find the basic colours for Artline, this brands seems to be very popular in Asia. But maybe the next time. 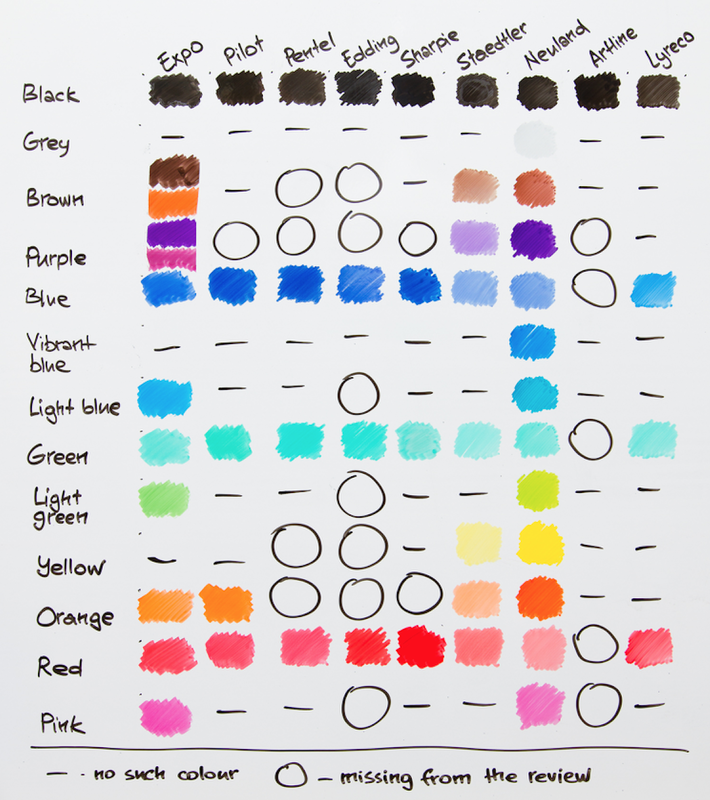 When it comes to the basic set colours, the best options are Expo, Pilot, Pentel and Edding. Sharpie and Neuland go after these because of their strange behaviour around pale colours. See more details below in the respective section. Neuland is the only make (which I am aware of) that produces the grey colour for whiteboard markers (although a bit too feint, but hey, this is the only grey available!). Believe me or not, but I have been looking for grey colour for several years before coming across Neuland. So this fact alone makes it worth mentioning. And their yellow is really awesome! Removing stains from the hands and clothing. This test was executed this way — I drew a line on my palm with black colour (as this is the most recognisable colour), waited approx. 5 minutes and then I used a regular hand soap to wash the stains off. The result is satisfactory for all the brands, in my opinion. Well, Sharpie and Neuland stains were almost washed off to be precise. But maybe that is because that part of my palm had the least riffles in the skin and therefore ink had nowhere to cling to. I would state that there is no winner here — every marker was really easy to remove from my skin. By the way, almost all of the manufacturers advise you against having your skin contacting with the ink. The alcohol (and maybe other substances used in the ink) is said to have a risk of skin irritation (thankfully I do not react to it). So be careful. A piece of cloth made of 100% cotton right after staining with markers (to the left) and right after the cloth has been cleaned in a washing machine (to the right). The next test was to check whether the marker stains can be cleaned off your clothing (100% cotton in this case, white colour) if you dirty it during your meeting or a workshop. 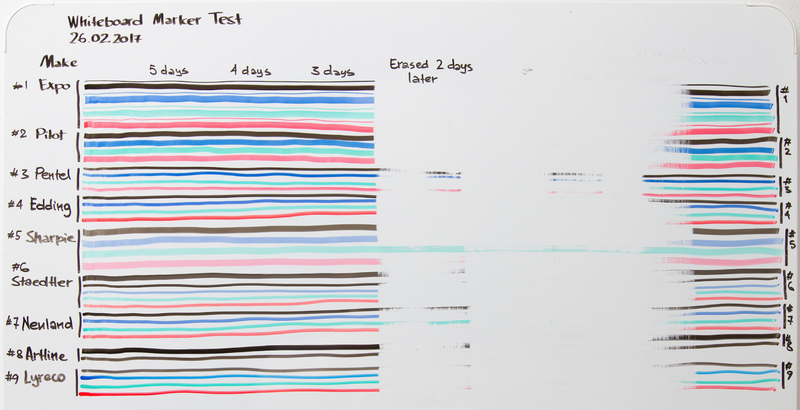 I’ve got some bad news for you folks — all of the markers didn’t pass the test. And please notice that the cloth was put into the washing machine right after it has been dirtied (which usually gives you much higher chances of cleaning the dirtied cloth). The cleaning mode was a very regular one, at 30C, using again a very regular detergent suitable for all clothing types. It did fade away a bit, but the stain was never removed completely. (Updated: it did not go away even after two more washing cycles.) And as you can see from the photo above, there is no real difference between different brands. Type of surface to use on. All of the assessed markers are advised to be used on whiteboards, glass, film and most of non-porous surfaces. So practically speaking, there are no advantages or disadvantages of the samples compared to each other. Let me put it this way — if there is a surface that one type of a whiteboard cannot write — then it is safe to state that other types would not be able to write on that surface. 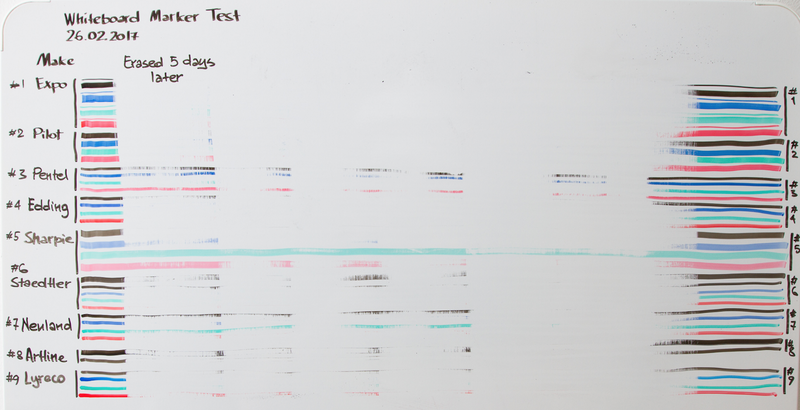 As far as the surface used for the tests under this article, these were executed on a very basic type of whiteboard I bought from IKEA. It is a metal board covered with a decent layer of white paint that (I hope) can sustain frequent friction (caused by whiteboard markers and dry wipes). Wipe 3 seconds later test — demonstrates the speed of drying. 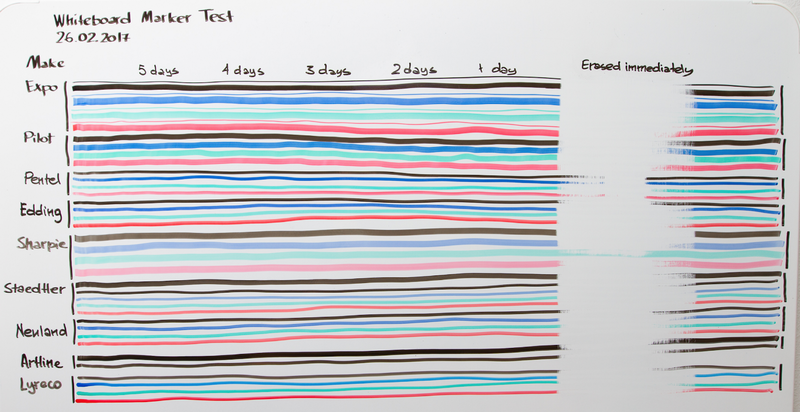 In my previous article on tips and tricks for whiteboards I mentioned that on average you should wait for approximately 3 seconds before attempting to wipe the freshly drawn line. I had come up with this time empirically, through the years of working with whiteboards. Now I used this empirical rule to compare the speed of drying of the markers under consideration, as some kind of a baseline. Pentel and Lyreco are somewhat acceptable. Expo, Edding, Sharpie and Staedtler are drying just too long. And again, this might not be a big problem. Once totally dried — these markers are easy to remove. So you should consider how critical this parameter is for you. Blending with previously drawn strokes and smudge proof. When you leave your drawing to dry, alcohol solvent evaporates leaving only the hard particles of the ink residing on the surface. When you draw over the old drawings, the alcohol from your the fresh drawings starts to dissolve the old drawings when it gets into contact with those. That is exactly why your drawings mess up when you blend colours. This is especially annoying when you draw red lines over the previously drawn black ones. Unfortunately there is not much you can do about it other than avoiding blending the colours. All of the whiteboard markers are prone to this issue and I cannot single out one that would be better or worse at this. I was not able to assess this parameter even though I would personally want to understand what marker is the most durable. Maybe I will come up with an easy way to check this out and that will be a topic for a much shorter article some time later. Tip shapes available and tip sizes available. There are generally three types of tips that are suggested for whiteboard markers. The size of the stroke correlates with the tip size. Bullet tip — the most popular type to be found. On average this type produces strokes worth of 2–3 mm. Chisel tip — number 2 on the popularity list. Since it is a chisel and it can produce three types of a stroke width, the range would be 2–5 mm. And the fine tip or extra fine tip (usually again, bullet shape). Normally these tips are claimed to produce 1 mm strokes. Some brands suggest more options for the chisel type. For example, you might find super fine chisel or super wide chisel for some makes, but that would be something you have to chase specifically and you usually do not find such models in common shops or not even in fancy stationery shops. All of the brands under consideration suggest the three types of the tip (except for Lyreco). Therefore you can purchase the type you prefer and there is no big difference from the perspective of this parameter. Tip type selection is always a choice of a personal preference. I prefer to use bullet tip for whiteboard markers, however recently I have started shifting towards the chisel tip. As far as the super fine tip, I use it back home to keep track of grocery shopping list on the fridge as this list would be considerably smaller in size if drawn with this type of the tip. Edding, the hardest of them all. Expo and Sharpie (their tips seem to be exactly the same). Lyreco, the softest of them all. Please notice, that even though Edding appears to be the hardest, to my opinion it is not absolutely the hardest. There are much harder tips available from other brands (outside of the scope of this review). Edding would be slightly above medium in my opinion if we take the absolute range of tips flexibility. Flexibility test for tips for Expo, Sharpie and edding. Expo and Sharpie seem to have exactly the same quality of their tips. It is medium flexibility. Good for small details, does not deform too much even if you apply extra pressure. Edding has superb quality and flexibility of its tip. It allows you to produce variety of line width with an impressive sustainability. The tip does not deform muchover time and you get the same experience drawing with it the entire lifetime of the marker. Pentel, Pilot and Staedtler put to the test of tip flexibility. Pentel has a very confident tip. Its flexibility is confident medium. Very pleasant to draw with. Seems to be prone to deforming and it feels to be long lasting. Pilot has medium flexibility of the tip. Very pleasant and easy to control the width of the line. Very good for the guys who enjoy drawing highly detailed pictures. Staedtler has a soft tip that prevents you from producing detailed pictures. You will have to stay on the level of 1.5–2 mm for the line width. Does not seem to be sustainable. 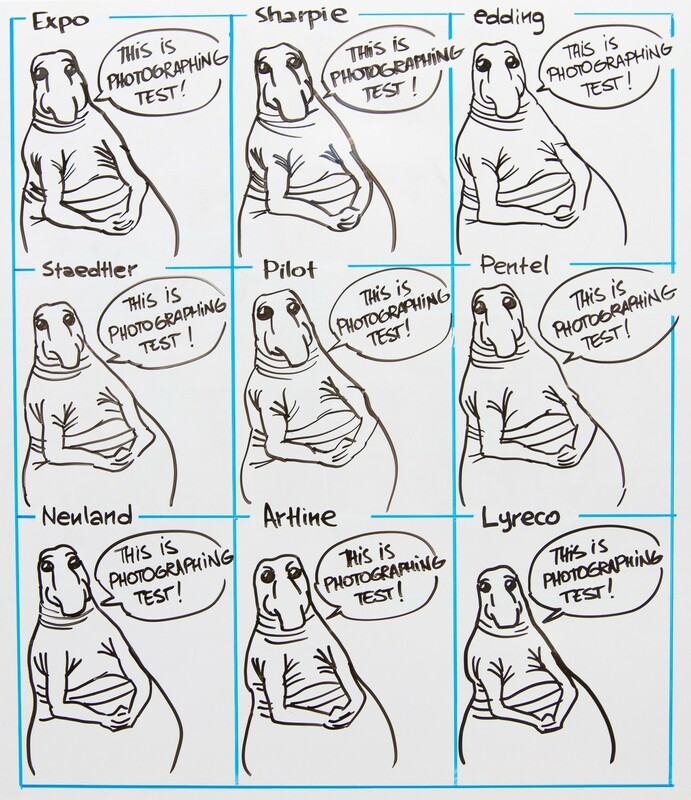 Neuland, Artline and Lyreco were tested for their tips flexibility as well. Neuland has moderately soft tip. Still it is possible to produce reasonable fine lines. I am lacking some stiffness to produce fine detail, but that is certainly not a huge problem. Artline’s tip is too soft for high level of detail. It is fantastic for fans of brush-like tips. It seems to be of a decent quality so should not fail you longer term. Lyreco has the softest tip, not appropriate for highly grained drawings. High level of detail — Pilot, Pentel, Edding. Reasonably fine drawings — Expo, Sharpie, Neuland and Artline. Only thick line drawings — Staedtler and Lyreco. Please notice that there are special fine line markers that are specifically built to draw fine detail drawings. It is natural to conclude that the softer the tip, the faster it wears down. You can say that these two parameters correlate with each other. Pilot, Pentel and Edding will last longer compared to other markers under consideration. Expo and Sharpie go next, as their tips are softer. Neuland will wear down even faster. Staedtler is very prone to wearing down. Lyreco tips are destroyed during the first few sessions, they are too soft and appear to be of inferior quality compared to other brands. Please notice that durability will also depend on your drawing style. Some people have lighter hand, some people put a lot of pressure. The harder you push, the faster is the tip to wear down. I tend to care for markers so they last longer for me. But I find completely destroyed markers when I enter meeting rooms. Does it mean that their tips are of low quality? Not necessarily. It is worth mentioning that you do not need to throw a marker away just because its tip is worn down. Almost all of the brands suggest replacement tips. I have heard that some guys are reverting the same tip when it wears down (I must say that I have never attempted to do so). I would assume that tips might be inter-changeable with different brands. How hard is to clean off the board? 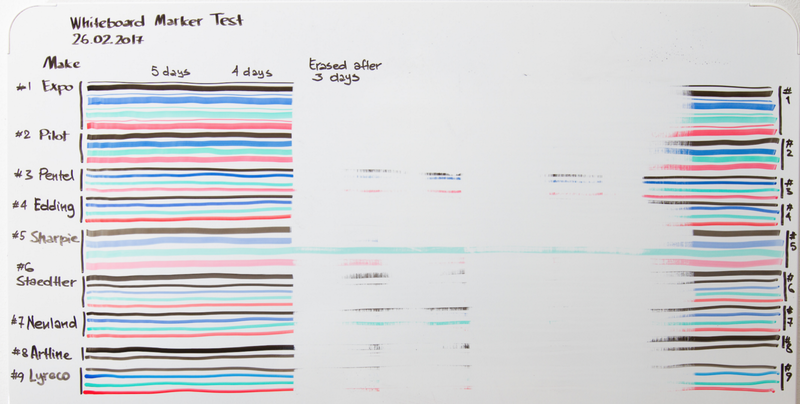 I have noticed that marker marks are harder to remove if you leave them on a whiteboard for some time, say several days. The ink appears to polymerize or whatever happens to it, but the ink stains can become really tough to remove long time after. The test picture. The lines will be consequently removed during the course of 5 days. A portion of the test image was erased immediately. As you can see, there are two problematic areas that are obvious to spot: Pentel colours (with the exception of the green colour) and the green colour for Sharpie. Another portion of the picture cleaned 1 day later. Another portion of the image erased 2 days later. Yet another portion of the test image erased 3 days later. And yet another portion of the test image erased 4 days later. And eventually the last portion of the image erased 5 days later. For some reason I have managed to wipe the stripe clean 1 day later. I attribute this success to probably a bigger pressure applied to the surface. During the test I would try to apply a moderate pressure — similar to the one you are applying to clean up the board with gentle and quick moves. Expo, Pilot and Edding are the easiest to erase. Even after 5 days the ink is removed easily. However, on the 5th day of the experiment, Edding becomes hard for the black colour (which correlates with my previous observations. I used to use this brand a lot before and the black colour would be difficult to erase if you let it stay on the whiteboard for a week or more). Pentel is resisting the cleaning day 1. Sharpie has a stubborn green, on the 3rd day the red colour becomes a challenge as well. Staedtler, Neuland, Artline and Lyreco have resisting blacks. Additionally to that, Neuland has cleaning issues with green and Lyreco has issues with its red. Even though some brands were more difficult to erase, they required just slightly more effort, eventually it was possible to remove their ink, it was just about a few extra moves. My verdict is that the issues with the above listed brands are not critical at all. It is just some markers are erased with great ease and some require just a bit more effort. It is obvious that the ease of erasing is heavily dependant on the type of the surface. 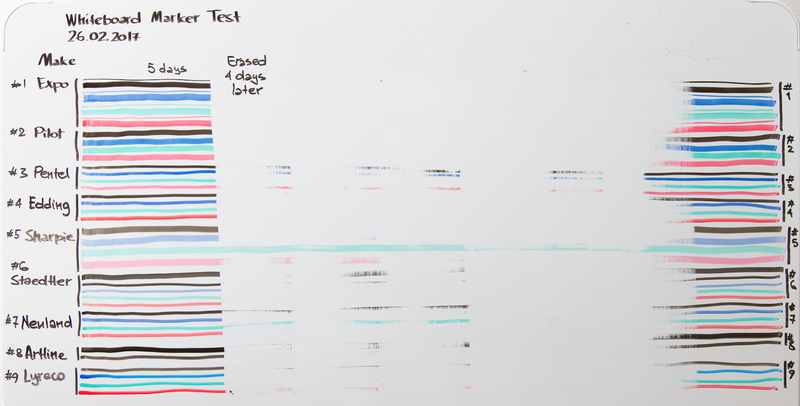 In this test I was using the metal IKEA whiteboard. It has a decent glossy surface and generally this is an easy surface to wipe from. Glass is also easy to wipe from (if it does not have nasty scratches). It will be more difficult to erase from the plastic film and from the porous surfaces painted with a special paint. How does the ink flow? I assume that ink flow is mostly influenced by two factors: viscosity of the ink and the quality of the felt tip. Lower viscosity ink would fluid more freely. Harsher fibres in felt tips may prevent ink from distributing evenly on the surface. The best ink flow — Edding. Ink flows well, covers nicely and does not leave those nasty gaps in the stroke. Neuland ink has a pleasant viscosity of the ink, good coverage, you can draw fast without a risk of low coverage. Expo — fantastic coverage, nice ink flow. Pilot — decent experience with the ink flow. Sharpie, Pentel and Artline — here I started experiencing deficiencies in the ink flow. Still satisfactory, but it is not an absolute coverage. You need to slow done for that. Lyreco — the ink seem to be a bit too thick, the quality of the felt tip sometimes leaves scratches in the stroke. OK quality still, but certainly not ideal. Staedtler — I was not happy with the ink flow experience. You certainly can work with this marker, but when you have options..
All of the markers under consideration vary in size, shape and weight. These parameters contribute to ergonomics and it is fair to state that usability of a marker is extremely individual — we all have different preferences, our hands vary in size, are motor activity is different. Here I will suggest my own likes and dislikes. Neuland suggest the best grip and the best balance of weight. It is pleasant to hold the marker thanks to the nice cavities on the marker sides. Edding is slim, light and pleasant to draw with. Overall observation is that I prefer slimmer marker over thicker ones. Artline and Staedtler go next. They are slim and well balanced. Pentel follows. I somehow find the shape of the ‘nose’ a bit confusing. I would prefer a more even transition of the form between the main trunk and the nose with the tip. 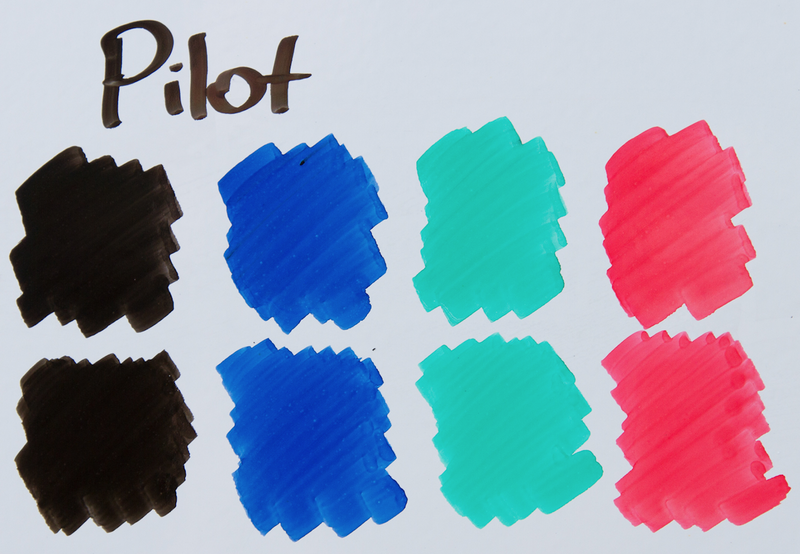 Pilot has a strange widening of the body toward its rear end, and it is also the heaviest (approx 22 g, other markers weigh in the range of 14–19 g). Overall I find it to thick. Expo and Sharpie go next. They are OK to hold and work. But ladies might find their caps a bit challenging to attach/disattach — it really takes some physical effort. Form factor comparison of markers under consideration. Change of colour over time (the fading effect). This test was run the following way — the four basic colours were selected for each of the tested make (except for Artline, I only had black for this make). I drew colour swatches for each make and for each colour and left them out there untouched for a whole week. The colour fade test. Each of the basic colour was drawn twice — first the upper row, and then the bottom row in 1 week time. Swatches are drawn close to each other for an easy colour matching. It is easy to see colour changes. There are surprises though. 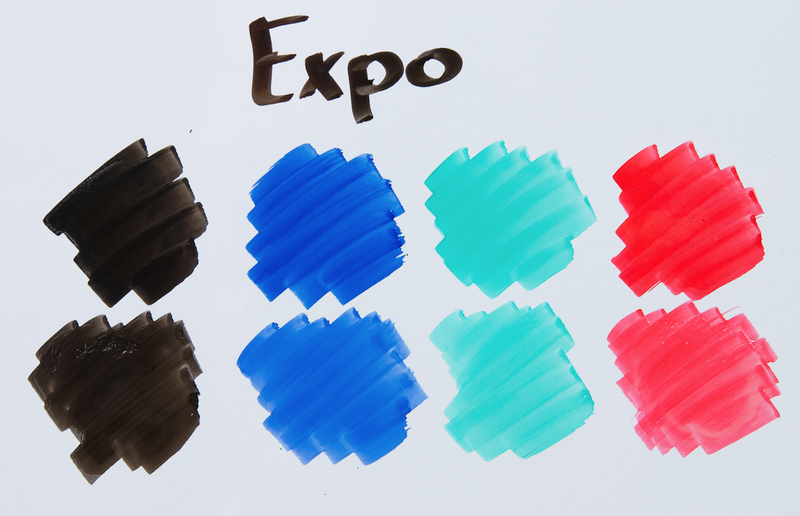 The obvious winners are Expo, Pilot, Pentel and Artline (for the black colour). But let’s go through the observations one by one. There are no dramatic changes of colours for Expo. In fact, the fresh colour (below) looks exactly the same as the 1 week old colour. Expo are fade-proof. Pilot is obviously colour fade proof. 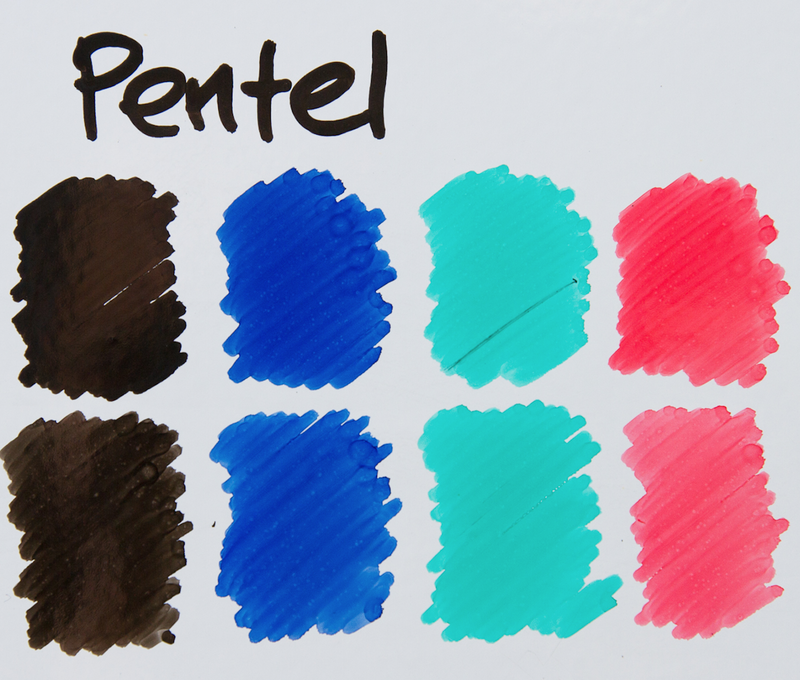 The same goes for Pentel — it is a confident colour fade proof. It gets tricky with Edding. While blue and green do not show signs of wearing off, black does fade away, though a little. Red fades dramatically. And these two colours are the mostly used ones. Sharpie is a bit tricky. It does look like its colours faded over time. And it might be true, to a certain extent. The thing is that its colours looked faded already when I drew them. This happened before and I do not have any explanation for this fact — sometimes whiteboard markers produce pale colours and after you leave them for a while — they start producing solid colours again. This happens in a totally unpredictable way and it is hard to identify any pattern here. 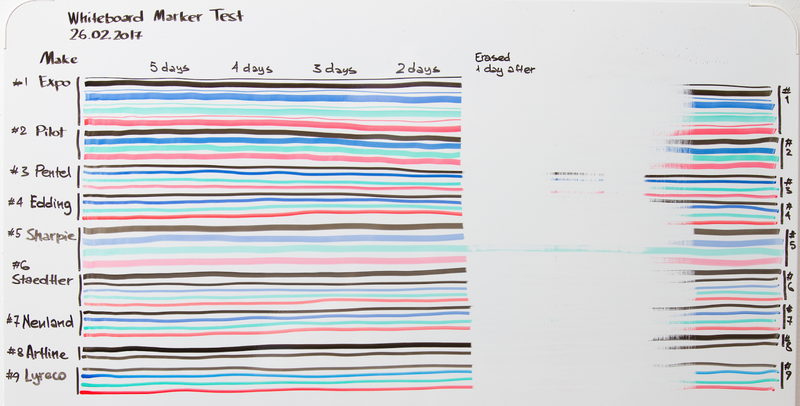 I can only tell this — the markers were stored horizontally throughout the time of the test, exactly as it is recommended by all the manufacturers. I was observing this phenomenon with Sharpie, Staedtler, Neuland and Lyreco. Did not notice this strange behaviour with other makes, at least so far. While we cannot explain what could be causing this, it is fair to state that these markers are unstable with their colour opacity. Staedtler is more or less stable, however I do notice a slight change in colour for black and red colours. So it is not fully colour fade proof. Here we have an opposite situation — some of the fresh colours became pale (slightly black and blue, red). No explanation. At least it does not fade over time. Artline is as black as pitch. No colour fade. Nice. Similar to other occurrences, Lyreco has demonstrated a strange change in colour for the freshly produced portions — black and red appear to be pale right out of the marker. The old swatches look much better, surprise! I have observed this strange behaviour for this make quite often. Again, I have not been able to track any dependency to understand what could possibly cause that. I want black to be black. Not grey halfway. And I completely agree to that. There are two situations you should be aware of when considering ink coverage (opacity). Some markers have intrinsic issues with ink opacity. 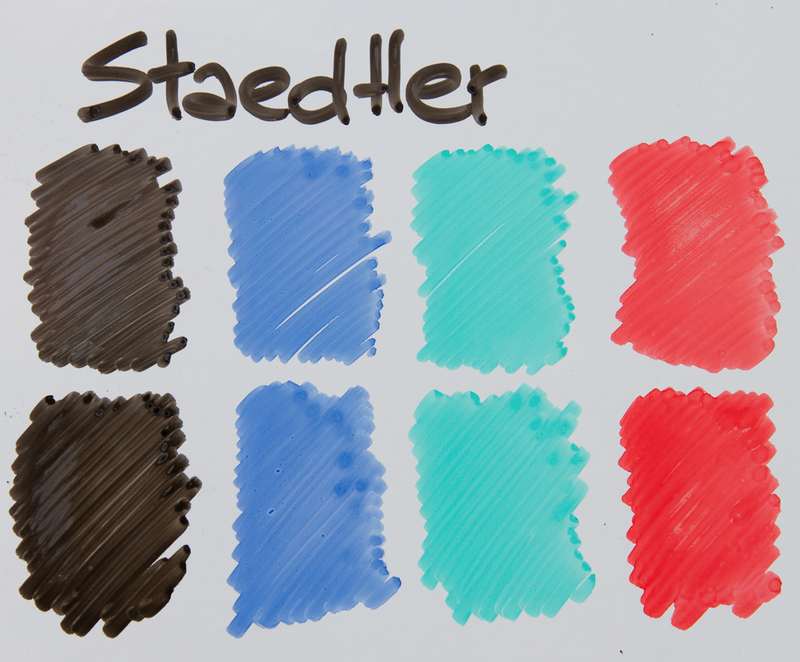 If you check the colour swatches above, you will see that Staedtler has stable low opacity for all of the colours. Some markers have decent ink opacity but sometimes they would start drawing with semi-transparent ink. And the next day they can be back to normal, totally unpredictable. Therefore such brands are not stable in colour opacity. Such markers are Sharpie, Neuland and Lyreco, according to my observations so far. And if you are after a strong black, these are your choice: Pilot, Pentel, Expo, Edding and Neuland. In order to verify how do these different markers look on photographs I drew the matrix containing of equally sized cells. Each marker was used to create a very similar picture with some small text. Most often we use black markers, hence I used this colour. Which marker will look the most comprehensive on a photograph? Draw lines of 1 mm and thicker. Use marker that has enough ink remaining. Do not write too small text, avoid too small elements (below 3x3 cm). Make sure there is enough light when you take a picture of your whiteboard, avoid patches of light that could spoil a part of your drawing. Bottom line — due to the combination of factors (quality of the tip, opacity of ink and the dynamics of ink flow) my personal preference would be given to Expo, Edding, Pilot, Pentel and Neuland. Neuland markers are designed to be refillable (there is an opening on the back of the marker where you would inject the new ink with the use of a special manual pump (like a small enema)), you simply cannot buy the refill ink to do that. This makes these markers quite sustainable since their felt nibs are replaceable too. This way you really minimize the waste and could use a single marker forever. Edding 28 — a marker with detachable tip that can be screwed off allowing access to the insides of the marker body. For this type you remove the tip part and then simply drip 40–60 drops of ink. Edding 360 — a marker that is completely sealed and you cannot get an access to the insides of the body. In order to refill you put the marker into the bottle of ink placing it felt with tip down and leave it there for 1 hour for the marker to soak in enough ink exploiting the capillary action — the ability of a liquid to flow in narrow places even against the force of gravity. While the first approach is a go for me as a customer (simply because it is fast), the second approach is not practical. Besides I think it is not fair to call such markers refillable — then there are no refillable markers in that sense. All of the markers can use the capillary action to be refilled that way. Staedtler has a similar approach to refilling their markers — you simply stick fatigued marker into a bottle of ink and leave it there for 4 hours. It is even longer than Edding 360 and therefore is further less practical. Pilot markers are refilled by replacing of an ink cartridge that is screwed onto the back side of the marker. And then you dispose of the empty one. This means that you still produce a certain amount of waste but at least the body of the marker is kept, so there is less plastic you are throwing away. The manufacturer suggests that you can replace the ink cartridge up to four times. I have no idea what prevents you from doing that more than 4 times. Maybe that is the life time limitation of a felt tip? But Pilot suggest that their felt tips can be replaced as well. Anyway. Pilot — the approach to the ink refill is the most reasonable. Edding (edding 28 model or alike) — you drop new ink into the insides of the marker body. The least irritating is Neuland. The most irritating odour goes to Staedtler and Lyreco. The biggest surprise are Sharpie and Expo. We expected them to be exactly the same. But as a matter of fact, Sharpie had less irritating odour. And they smell differently. Obviously they use different inks. All of the brands under consideration state their markers to be xylene and toluene free. All of them are alcohol based. I was able to retrieve detailed safety data sheets for Artline and Lyreco markers. These documents suggest a lot of detail but the most important to know is that it is ethanol and various types of propanol which are imposing the biggest threat to health. According to the classification these substances may cause eye irritation damage and drowsiness or dizziness. Therefore, do not deliberately inhale, avoid contact with your skin and your eyes. You should be safe and sound otherwise. The manufacturing process, energy saving approach and other production related conventions that manufacturers abide to ensure the positive ecology foot print. This is something we as end customers have obvious difficulties to verify and therefore we leave this factor out. The amount of recycled material used to produce the plastic parts of markers or materials used for packaging. Edding and Pilot are actively marketing their efforts in this direction. Whether markers are refillable or not. In my opinion this factor is the most important for us as end customers. I think that we pollute the Earth the most by throwing away things that we do not need anymore, especially the ones made of plastic. Therefore it is a good idea to use markers that are refillable — then we could really reduce the plastic waste. Refillable are Pilot, Edding and Staedtler. Hopefully, Neuland becomes refillable again soon. UPD Neuland has made their re-fill ink for whiteboard markers available again. Water based or alcohol based. All of the samples under consideration are alcohol based. I can safely state that all the whiteboard markers intended for the office use are alcohol based. There are indeed rare cases of water based markers that are wet wiped and intended for use on non-porous surfaces, but you need to thoroughly search for those specifically, these types are not easily available from regular stationery shops. Pricing is very tricky. It really depends on where you are geographically as the same markers can cost dramatically differently market to market, country to country. The general rule is that the lowest prices for markers are in USA. From what I have observed, Denmark suggests prices among the highest. 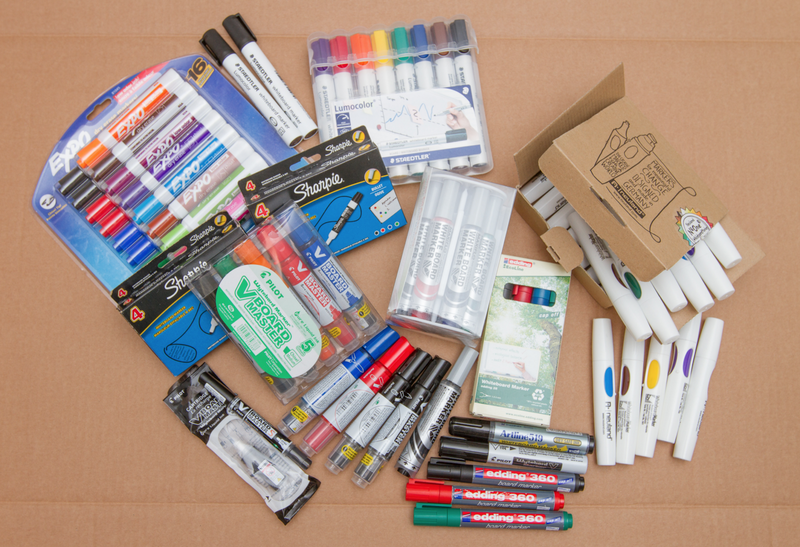 Another observation is that buying markers online would be cheaper than buying markers from the retail store. Markers in general store might cost more than same markers in a specialised stationery shop. 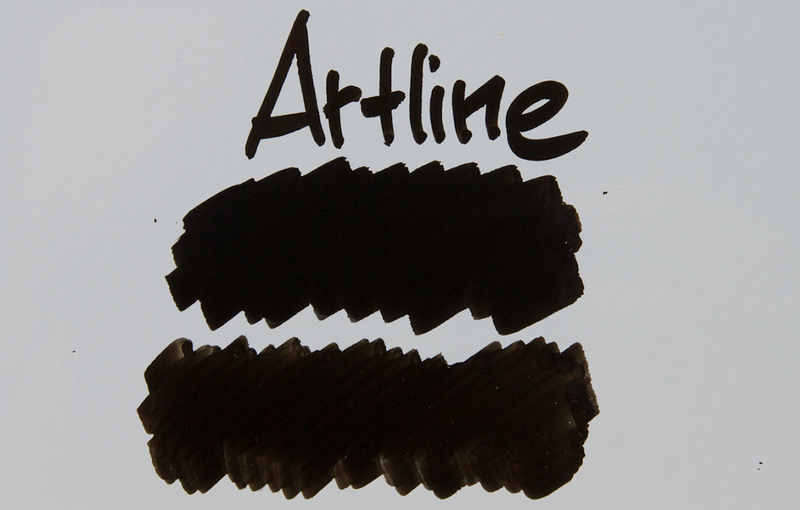 Artline — the most expensive. Apparently the brands are not homogeneously available in different locations around the globe. I will mention three large areas in this article: North America, Europe and Asia. The screening has been performed by asking my friends to drop into their local stationery shops and take pictures of the assortment there. Notice that online stores usually suggest more options than retail shops. Nevertheless, this screening is somewhat revealing and allows for certain patterns. US (California and NYC)— Expo, Bic, Staples. Germany (Munich), Netherland (Apeldoorn) — Staedtler, Edding, Schneider. Denmark (Copenhagen)— Staedtler, Edding, Pilot, Sharpie. Sweden (Stockholm) — Pilot, Staedtler. Malaysia (Kuala Lumpur) — Pilot, Pentel, Artline. Singapore — Pilot, Pentel, Raymay. 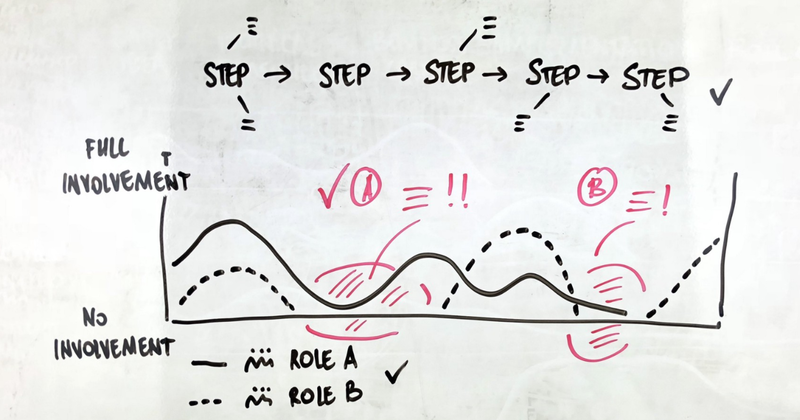 There are more articles to read: Creating a visual explanation step by step, the insanely nerdy and detailed overview of sticky notes by Matti Schneider and Whiteboard tips and tricks. Enjoy! If you found this aricle valuable, please spend an extra second and click on those👏 (remember that you could express the amount of the value with more ‘claps’), share the story with your friends, and follow me on Medium. Yuri Malishenko is an active practitioner, an author and a trainer on the topic of visual thinking and visual facilitation. 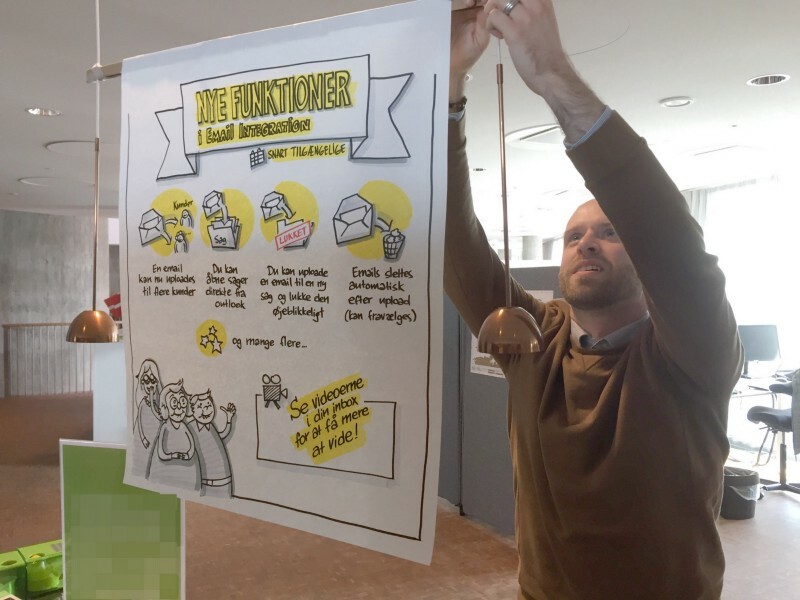 He works as an agile coach for the Danish company and uses visual skills every day to co-create better software products and to become a better person. Check out his recent practical guideline on mastering basic skills of visualisation. If you like this type of content, follow Yuri on twitter @YuraMalishenko and facebook. Visual thinker, agile coach, product owner.